ARCATA, Calif.— The Center for Biological Diversity and the Environmental Protection Information Center filed a formal notice of intent to sue the U.S. Fish and Wildlife Service today for failing to protect the coastal marten, a secretive member of the weasel family, under the Endangered Species Act. The groups, represented by the public interest law firm Earthjustice, petitioned in 2010 for federal protection of the rare carnivore, then known as the Humboldt marten, but the Service issued a decision denying protection earlier this year. Photo courtesy U.S. Forest Service. This photo is available for media use. 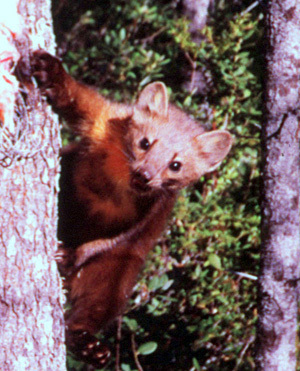 A small carnivore related to minks and otters, the coastal marten is found only in old-growth forest and dense coastal shrub in Northern California and southern and central coastal Oregon. Once extensively trapped for their fur, the cat-like animals were once common, but now fewer than 100 of them survive in California, while an unknown, but very small, number are still found in Oregon. Coastal martens were believed extinct — with 95 percent of their old-growth forest habitat lost and a history of excessive trapping — until they were rediscovered on the Six Rivers National Forest in 1996. In 2009 the first marten to be photographed in recent times was detected in Prairie Creek Redwoods State Park by remote-sensing camera. These martens’ historic range extends from Sonoma County in coastal California north through the coastal mountains of Oregon. In Oregon the marten lives in the Siskiyou and Siuslaw national forests. The extremely secretive animals are known for their slinky walking motion and ferocious hunting skills. Typically about 2 feet long, with large, triangular ears and a long tail, they eat smaller mammals, berries and birds, and are preyed on by larger mammals and raptors.